Everybody who understood the uses of power and the necessity for acquiring it and holding on to it knew you couldn't be a Boy Scout all the time. If you tried, the Boy Scouts who took time off to throw knives would pin your hide to the wall." Andrew F. Tully Jr., (October 24, 1914 - Sept 27, 1993), author, columnist and war reporter was one of the first American reporters to enter conquered Berlin in April 1945. His writing career spanned six decades and his works included several novels and popular nonfiction books on the workings of Washington, where he was a syndicated political columnist for more than 20 years. 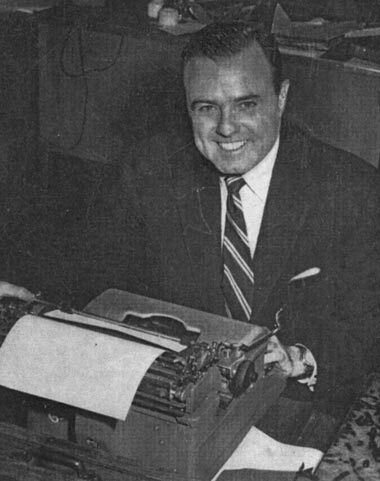 In 1962, Mr. Tully had both a novel, Capital Hill, and a nonfiction book, C.I.A. : The Inside Story, on the New York Times's best-seller lists. He started working for newspapers while still in high school, as a sports reporter for his hometown daily newspaper in Southbridge, Mass. At 21, he bought the town's weekly newspaper, The Southbridge Press, for about $5,000 with loans from friends, making him the youngest newspaper publisher in America. He sold the paper two years later and became a reporter at The Worcester Gazette in Worcester, Mass., leaving there to become a correspondent in Europe for The Boston Traveler during World War II. He began writing his own column in 1961, which came to be called Capital Fare, and was syndicated in more than 150 newspapers at its peak. He was the author of 16 books in all, including Where Did Your Money Go? with Milton Britten, an examination of foreign aid, and Supreme Court, a novel. Mr. Tully was married to the former Molly Wood and had three sons and two daughters.